Lurking in the darkest depths of the Perseus cluster is an ancient key to help unlock the astrophysics of galaxy clusters. Here on Earth, figuring out the properties of a fluid is relatively straightforward. A lot can be learned by just simply putting it in a beaker and swirling it around with a spoon. But what if the fluid in question is a highly ionised and magnetised 50 million degree plasma, hundreds of millions of light years away? This is the problem facing us as we try to understand the physical properties of the gas between galaxies in galaxy clusters. This 'intracluster medium' (ICM) contains the vast majority of the baryonic mass of these cosmic behemoths, which weigh up to 10 million billion times the mass of the sun. As the largest gravitationally bound structures in the universe, galaxy clusters continue to grow and accrete matter from the surrounding cosmic web. As the infalling gas falls into their deep gravitational potential wells, it is shock heated to tens of millions of degrees, and begins to emit prodigiously in the X-ray band. Over the last 50 years, increasingly powerful X-ray telescopes have peeled back the mysteries of the intracluster medium. In cluster cores we see the imprints left behind by powerful AGN feedback from the central supermassive black hole, which inflates enormous cavities. By assuming the ICM to be in hydrostatic equilibrium, we can find the masses of clusters, providing a cornerstone for measuring cosmological parameters. But our understanding of all of these is limited by how well we understand the properties of the intracluster medium. Fortunately for us, nature has provided us with a way of seeing what happens when the intracluster medium is literally sloshed around! Instead of a beaker, the gas moves around in the extremely deep gravitational potential well of the galaxy cluster. And instead of a spoon, the sloshing is produced by small, infalling subclusters, which pass close to the cluster core. The gravitational attraction between the cluster core and an infalling subcluster causes the core to slosh around, producing a characteristic spiral pattern of 'cold fronts' where the gas density falls sharply, while its temperature rises. Simulations of the rising spiral pattern of cold fronts due to gas sloshing over billions of years. These cold fronts rise slowly outwards with age, providing a record of the minor merging activity. However as they rise outwards, they become dramatically fainter in X-rays, becoming very difficult to see. 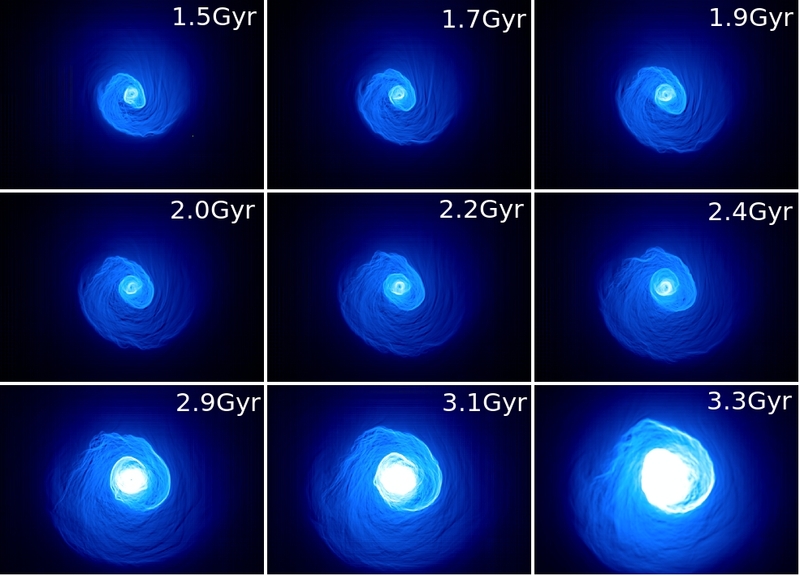 Detailed measurements of young sloshing cold fronts in X-ray bright cluster cores are commonplace, but until now no one had studied their much older, fainter relatives, lying in the cluster's outer regions. 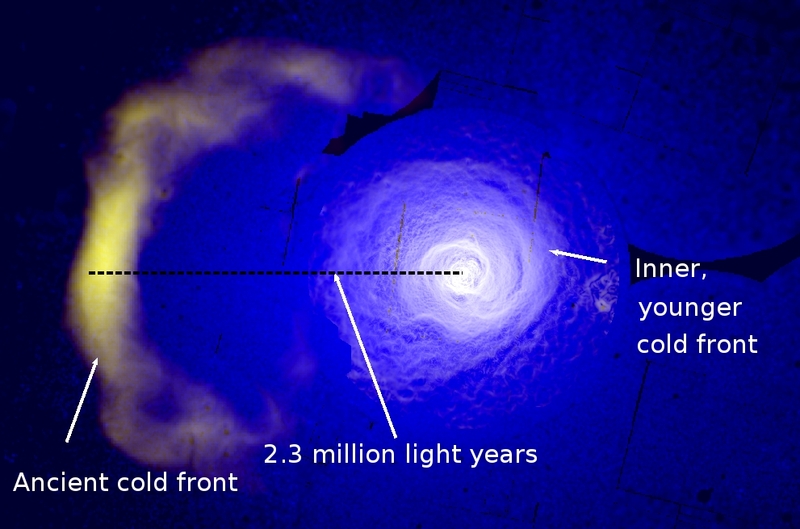 For around 5 billion years, the ancient cold front in the Perseus cluster has been rising slowly outwards. Over this time it has risen through the varied strata of the intracluster medium. In the core AGN feedback reigns supreme, dumping its energy into the ICM through sound waves and turbulence. Moving into the outskirts, the turbulence now comes from gas falling onto the cluster as it continues to form. All of these processes have had the opportunity to effect the form and shape of the ancient cold front. In addition, the velocity shear at the cold front edge is susceptible to Kelvin-Helmholtz instabilities. Over 5 billion years, plenty of time has elapsed for these to distort the cold front form. Yet despite all of this, our new Chandra observations show that the cold front remains incredibly sharp, with jumps in gas temperature and density that are near to instantaneous. Somehow, in that face of all this bombardment, the cold front edge has survived intact. Rather than being eroded or smoothed out, it has actually instead split into two distinct sharp edges! Comparing to numerical simulations of this sloshing, we find that this splitting is consistent with a type of 'hook' shaped instability which may have formed back in it's youth, and which has also survived and grown for billions of years. It appears that magnetic fields, draped over the surface of the cold front, have been able to protect it from disturbances, even as it has risen over 2 million light years from the cluster core. Everything about galaxy clusters is extreme. When the ancient Perseus cold front first formed 5 billion years ago, our solar system didn't even exist. Every billion years or so another infalling subgroup will likely stir up the sloshing in the Perseus cluster, winding it up, counting out another era of cosmic time.